I love a straightforward dinner. However being straightforward doesn’t mean there’s any skimping on flavour. Grabbing a few ingredients out of the fridge and cupboards, chucking them in a roasting tray and miraculously taking the finished dish out of the oven at the end is the weeknight dream. 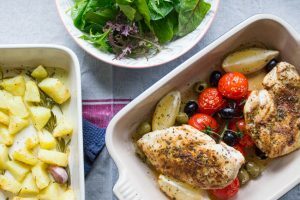 My Greek chicken tray bake is a two tray affair (I know, slightly more involved than one tray) and really delivers on flavour. The flavours of Greece; oregano, tomatoes, olives make this a wonderful dish for this time of year. Start by adding the potatoes to a pan of cold, salted water. Bring the pan up to the boil and boil the potatoes for 5-10 minutes or until just softened when tested with a knife. Drain the potatoes and put to one side. In a roasting dish add 2 tbsp olive oil, the garlic cloves and rosemary ad mix everything together to ensure the garlic and rosemary are well coated in oil. Tip the potatoes into this dish with some salt and pepper and give everything another good mix. Bake the potatoes in a preheated oven at 180C for 30 minutes. Once the potatoes are in the oven, start on the chicken. 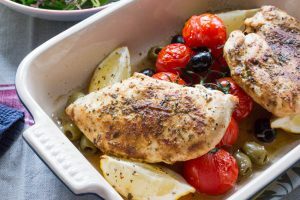 Place each chicken breast between two sheets of cling film or baking paper and flatten slightly with a rolling pin, you want each one to be around 1cm thick. Sprinkle the oregano and paprika over each piece of chicken with a little salt and pepper. Put a large frying pan on a medium/high heat with a little olive oil. Fry the chicken until golden on both sides then turn off the heat and put to one side. In another roasting tray put the lemon wedges, tomatoes and olives. Arrange the chicken on top of the tomatoes then add a little more salt and pepper and a drizzle of olive oil. Add this to the oven with the potatoes for around 15 minutes, or until the chicken is cooked through. I think a small red onion, cut into wedges and nestled in amongst the potatoes would be a fantastic addition to this tray bake. It would also be worth adding a little sprinkle of feta over the chicken for a deliciously salty kick. When the chicken has finished baking, don’t discard all the tomato and lemon juices that have gathered in the roasting tray. They are absolutely delicious and need to be savoured and poured over the chicken. My Greek chicken tray bake even manages to make its own sauce; what more could you need? I love one tray meals. This looks really tasty. Oh, Yes! Caroline! This is what I need in my life – so much flavor and so easy – Thank You! I love one tray meals like this and this one look flavorful and delicious! I’m good with a two tray recipe for a yummy looking dish like your Greek Chicken. We try and keep it simple during the busy weekdays, so this fits right in. You had me at one tray! This is a perfect winter dish and also good for a crowd. And I know my fresh Greek oregano will help make this shine! Definitely, I have some Greek oregano in the garden and it is so punchy! I think I might try adding some flavoured olives next time, maybe ones with garlic or chilli. definitely a perfect weeknight meal–two thumbs up! One pan dinners are just fantastic, so time-saving and fewer dishes are always a bonus.